Few heavy rock bands have enjoyed as much publicity as Sweden’s Ghost in recent years, primarily because the anonymous quintet combine music that is actually good with an image that is actually memorable. If either element had been missing, Papa Emeritus and his gang of ‘Nameless Ghouls’ would never have received the glowing endorsements from James Hetfield and Phil Anselmo that have made the release of their second album, Infestissumam such an anticipated event. 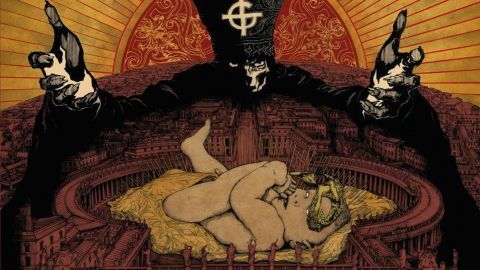 If you’re familiar with Ghost’s 2010 debut album, Opus Eponymous, you’ll know broadly what to expect from the new songs. Ghost wear their infernal influences proudly on their voluminous sleeves, invoking Sabbath, Mercyful Fate, BÖC and Deep Purple on pretty much everything they do. While those classic influences are all over Infestissumam, Ghost have also chosen to explore lighter, more leftfield directions, making some of the songs an eye-opener for anyone expecting full-on Ozzy and King Diamond worship. Although Ghost’s recent cover of Abba’s I’m A Marionette, which featured Dave Grohl on drums, isn’t here, the same approach applies to much of Infestissumam. You’ll hear the same creepy overtones, unhinged riffs and Uriah Heep-style organ all over Secular Haze Circus, Year Zero and Monstrance Clocks. Warm, heavy riffing straight from the box marked 1976 remains Ghost’s musical template, and is the stomach-churning core of melodic anthems such as Depth Of Satan’s Eyes and Body And Blood. Where Infestissumam really steps into unforeseen territory is when Ghost turn their hand to radio-friendly rock. With not a whiff of heavy metal about them, Jigolo Har Megiddo and Ghuleh/Zombie Queen are the surprisingly welcoming heart of the record. The former has a catchy chorus that you’ll be humming for hours. The latter begins as a beautiful strings-laden ballad before stepping up into stadium-rock territory and a genuinely massive finish. Who saw that coming? Infestissumam is not the perfect album, and nor, we suspect, was it intended to be. Although the choruses never fail to grip the listener by the earhole, some of the super-cheerful passages on Body And Blood are just too poppy to be digested easily. Meanwhile, if you don’t like luscious layers of close-harmony vocals, often delivered by a choir, don’t even bother listening to the amazingly expansive Idolatrine. All credit to Foo Fighters/Rush/Stone Sour producer Nick Raskulinecz, who tweaks the faders here; he has created an album with sumptuous amounts of vocal and musical instrumentation, but anyone expecting raw, unpolished vitriol will be disappointed. Forget the theatrical trappings, highly enjoyable though they are. What Ghost really represent is proof that old sounds can be recycled into something that sounds fresh, new and exciting, even if you think you’ve heard them all before. What’s more, having a demonic pope for a singer is one of the best-implied comments on the state of the modern world in ages. Thumbs up for that alone.